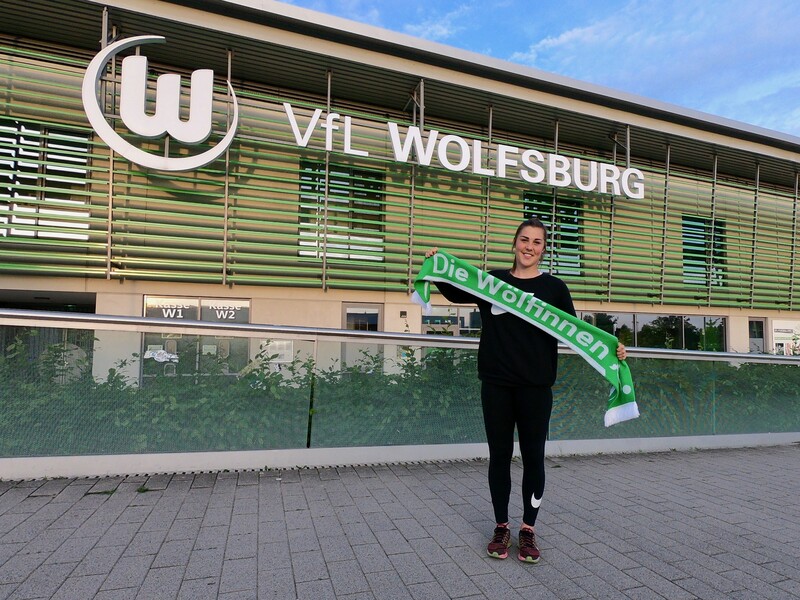 VfL Wolfsburg today confirmed the signing of 25-year-old England goalkeeper Mary Earps on a 12-month contract, starting 01 July 2018. Earps will wear the #27 shirt and becomes the first Englishwoman to play for the Club. Earps had previously joined Reading at the start of the 2016 FA WSL1 season. In the corresponding period, Reading improved from 9th place to 4th place with Mary an ever-present member of the team. Her performances in the first season saw Earps being named the Club’s Player of the Year for 2016 and selected to the PFA Women’s Football Team of the Year in April 2017. This form continued into the 2017/18 season, where Mary registered the highest number of clean sheets in WSL1 (8). Prior to Reading, Earps played at Bristol Academy and Birmingham City — with both Clubs playing Champion’s League football during her time there. VfL Wolfsburg have been one of the most consistent and successful performers in European football in recent years. This season, Die Wölfinnen won the German Frauen-Bundesliga with two games to spare, ahead of FC Bayern Munich, before winning the DFB-Pokal final on penalties (0–0 AET). In Europe, Wolfsburg were runners-up to Lyon in the Champion’s League, after dominant displays in earlier rounds against Atletico Madrid, Fiorentina, Slavia Prague and Chelsea. Mary replaces the outgoing Merle Frohms, who joins SC Freiburg, and will deputise to German international Almuth Schult. Earps has represented England at every age group and earned her first cap in June 2017 as a second-half substitute vs. Switzerland. A presence at senior camps for the past two years, Mary is currently with the Lionesses preparing for this weekend’s Women’s World Cup qualifier vs. Russia. Mary Earps: “I’m incredibly excited to be joining Wolfsburg — to be joining one of the best teams in the world truly is a dream come true. I’ve wanted to play in Germany since I played in the Champion’s League here a few years ago — it’s a very competitive league and I can’t wait to get started. Ralf Kellermann, Team Manager, WOB: “It’s not easy to get an internationally-experienced goalkeeper to VfL when we already have one of the best goalkeepers in the world in our squad. Therefore, we are very, very happy, that we were able to sign Mary Earps; although only 25 years old, she is already a very experienced goalkeeper and my first impressions are that her ability and attitude fit perfectly in our team.